Yesterday (Saturday) was Epiphany. It is that Holy Day when we celebrate the Magi visiting Jesus and the star-studded revelation that led them to the Christ child. You were probably taught long ago that there were 3 magi (wise men or kings) each bearing a gift: gold, frankincense and myrrh. However, the old hymn (We Three Kings) is not exactly correct. We don’t really know how many Magi visited Jesus. It could have been a dozen or just two. Over the centuries people have assumed there were three magi because there are three gifts listed in the scripture. But go back and read the story in Matthew 2 again and you will see that there is no mention of how many magi cam to visit. We’ve also been taught that the magi were a part of the manger scene along with animals and shepherds just minutes or hours after the birth of the Christ child. And that is also not exactly true. In fact, it could not have been the night of Jesus birth because the story says that the magi arrived in Jerusalem AFTER Jesus was born. The go around Jerusalem searching for the child and eventually word gets to Herod who takes time to call his own scholars together to do some research. Herod ends up calling the Magi before him to question them. And it is only after this that the Magi set off for Bethlehem. You see, no way all this happened in one night and the scriptures don’t even try to say it all happened during one night. It could have been months…even up to two years (remember Herod’s command was that every child 2 and under who lived in Bethlehem would be put to death). So, we clearly don’t have everything right about the wise men. So I’d like to look at them a little closer. First, these wise people were students, lifelong learners. And they had been studying. They did not just see a big star in the sky one day and travel to find it as we might assume. This was no accident. They knew astronomy and history. They had searched sacred texts. And the results of all their studies told them of a sign. Second, these scholars were not just bookworms. They also were observers of the world around them. They gazed at the stars, they observed cultures and traditions, they paid attention to the habits and traditions of other people and they valued them with a respectful, curiosity. Third, they sought connection to what they had studied and observed. They moved, put their feet (or perhaps their camels’ feet) in motion to follow the signs. They took a chance to meet, to reach out and to confirm the truth about what they had learned. They understood they didn’t know it all and so they asked directions along the way as they sought this connection. And they offered gratitude for the opportunity to make this connection…giving gifts of gold frankincense and myrrh. Finally, after studying and observing and reaching out to make connection, they remained open and attentive to further understanding and insight—and so they were responsive to warning to go home by another road delivers to them through a dream. That’s a pretty good process to live by. And I would venture to say it is the very process through which we enter into this sanctuary today. We are here to observe – and too often we forget this…but we are here to look out upon the world and learn how the world interacts with God’s word and how God’s word interacts with the world. And lastly we come here to remain open – to admit that none of us know it all, that we do not have the corner on truth, that we still have much to learn. So today, let us study observe connect and be open to the leading and guidance of the spirit as we worship together. We will be in the book of Mark this year. Mark is the shortest gospel in the bible. Mark uses the word immediately a lot – about 41x (only 10 in the rest of New Testament). Immediately communicate the intrusive nature of the gospel. The good news breaks in suddenly, without warning. There is no birth story in Mark. It begins with a brief reminder of a prophecy in Isaiah and then jumps immediately into the Baptism of Jesus. God is pleased with Jesus and he has not even done anything yet. All Jesus did was show up and get baptized. And we don’t even think about this. But it’s true! Jesus didn’t earn God’s pleasure. It was a gift. You and I, we don’t earn God’s pleasure either. It’s a gift. So, maybe we should stop seeing God as some judging, vengeful being who is mad at us when we sin and go astray. Maybe instead we should turn our thinking towards the God who is pleased with us when we show up. Speaking of showing up, why does Jesus show up to be baptized anyway? Think about how we typically understand baptism today. What has he done that he needs to repent from? What sin has he committed that he needs to be washed clean of? What is he turning away from? Is he really just now committing his life to God? If you think about it, it may seem kinda strange that Jesus gets baptized at all. It we often have this kind of narrow minded view of baptism. That it is some act that cleanses us for all time or somehow imparts salvation to us. That baptism somehow gets us in heaven or at least is the first step or most major steps towards it. These are not wholly wrong. But they are not wholly right either. They are too limiting. Baptism is a step on the journey. It is a ritual of cleansing. It is a symbol of, even a channel through which we see and experience the grace of God. It is an act through which we mark a turning in our life, a step of spiritual maturity, a part of the process of embracing the call from God on our lives. And this is where Jesus steps into the waters of baptism. Baptism for Jesus is (at least in part) about turning himself towards his ministry . . . maybe even towards the cross. Think about that for a minutes. And think about your own baptism. Did baptism turn you towards a ministry? A mission? What is we Christian took on a similar process in our baptismal preparation? What would your personal statement of belief be? Would would your mission statement be? To serve Christ through mutually supporting one another & embodying God’s grace and love for all. Consider how baptism for you is about turning towards a ministry, towards a mission. Consider how baptism is God’s claim upon your life for his kingdom. Consider what call baptism places upon your life, your heart, and what you must do to fulfill the potential of baptism in your life. Remember baptism is only a beginning, not an ending. It may start the journey, but you must walk the journey. For when we turn towards a ministry and mission through baptism, and when we take tangible steps towards that fulfilling that ministry, then we joining God in the redemption of all creation. And that, brothers and sisters, has everything to do with why God has given us life in the first place. 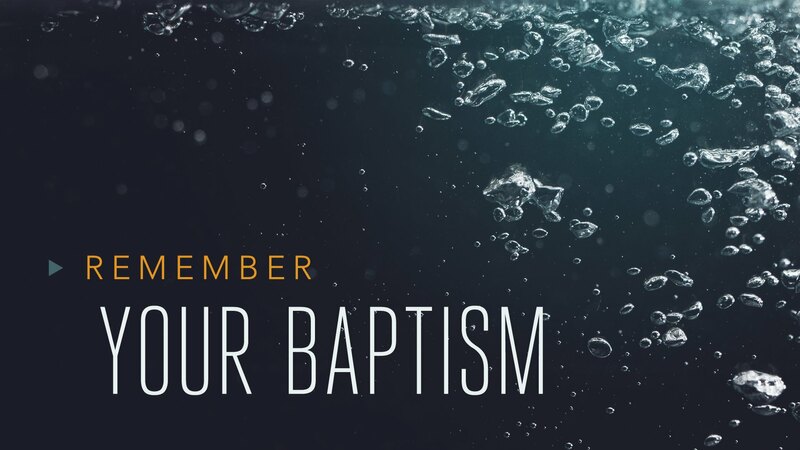 Today let us remember our baptisms, renew our baptism, and be thankful for the love and grace we receive through our baptism each and everyday that we take steps towards the kingdom of God.